With deep regret, the Trustees of URANTIA Foundation annuounce that due to Illness, Edith E. Cook is unable to continue to serve as a Trustee. At the beginning of this year, Edith suffered several strokes. On April 24, 1986, it was determined that Edith's health would not allow her to continue as a Trustee. 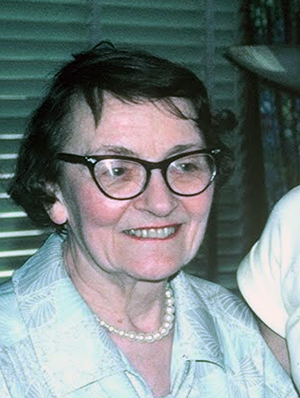 Edith was one of the founders of the URANTIA Foundation on January 11, 1950 and served as a Trustee from that date. She also served as its Treasurer and Assistant Secretary for a number of years. Besides her 36 years of dedicated service with URANTIA Foundation, Edith was also very active in URANTIA Brotherhood from its inception in 1955. Edith was among the first General Counselors selected in 1955 and she continued to hold that office until 1982. She served as a member of the Judicial Committee from 1955 to 1978. She also served as a member of the Special Projects Committee from 1959 to 1976 and was Chairman of that Committee from 1964 until leaving it in 1976 when she was elected Treasurer of URANTIA Brotherhood, a post she held until 1982. During the time she served as a committee chairman and Treasurer, she was a member of the Executive Committee of URANTIA Brotherhood. Edith was also a charter member of First URANTIA Society and held various elected positions within that group, including the post of Vice-President. Those of us who have had the opportunity to work with Edith and call her friend will miss her quiet dedication and selfless commitment. Rain or shine, in sickness or good health, Edith could be counted on to be at her desk laboring to the best of her ability to support the work of the URANTIA movement.